JORDAN RIVER, B.C. — Since it’s debut in North America two decades ago, the Honda CR-V has been a performer of Olympic-like proportions. Not only has it been on the podium most of those 20 years as a top-three segment leader, like the global sporting event, a new model has come around every four years. For Canadian sales, the 2016 CR-V is wearing the bronze medal, with the Ford Escape capturing silver and the Toyota RAV4 on the top of the podium. For Honda, that’s simply not good enough for a vehicle that is made in this country and has captured gold in the past. So, with the four-year cycle of the fourth-generation CR-V complete in 2016, the all-new fifth-gen is out this month – and it’s clear the 2017 CR-V is in it to win it. 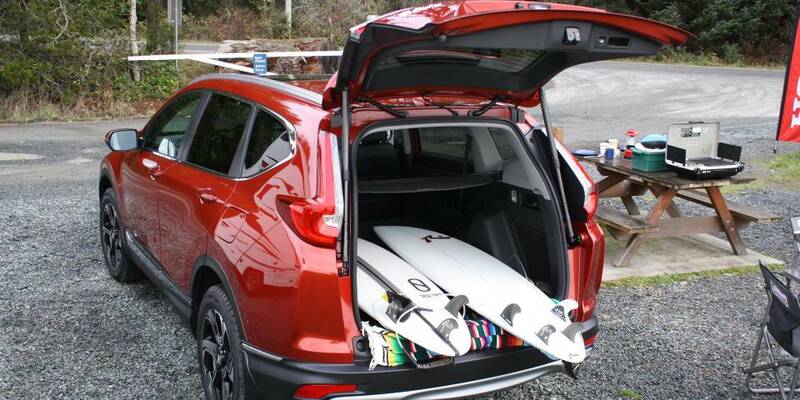 Honda is the first to admit that the outgoing model had a … well, not necessarily flabby, but certainly not flattering exterior physique when posing beside the muscular and aggressive-looking new-gen RAV4 and Escape. Likewise, the CR-V’s cabin was dated, both in design and content, and certainly not up for the challenge of competing with the tech-brimming Escape and the sophisticated style of the RAV4 interior. And finally, the performance of the 2016 CR-V just didn’t cut it in either sprints or marathons with those top two contenders. So, Honda engineers and designers went back to the gym and worked out some of the styling and performance tips from the company’s current gold medal segment performers — like the the Civic and the HR-V — to sculpt an all-new CR-V that the company believes is ready to take on all comers and reclaim the gold. 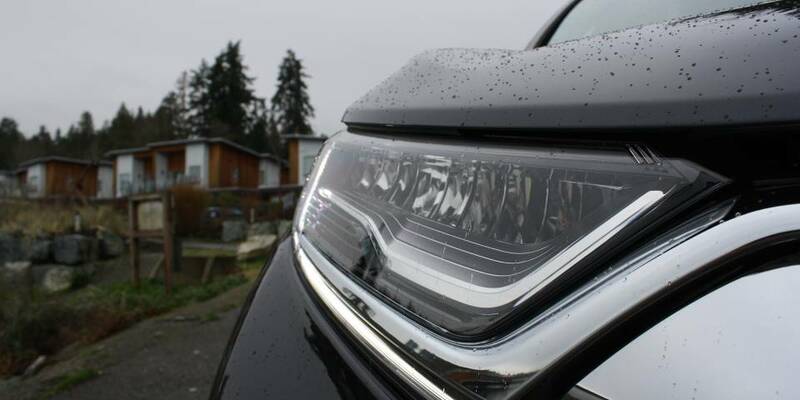 And so Honda gathered automotive journalists from across the country on the southern edge of Vancouver Island this week to unveil the all-new 2017 model, and lunchtime chatter after the morning drive seemed to indicate Toyota and Ford will be hearing footsteps in the coming year in the subcompact SUV segment. A segment, by the way, that is the largest by volume in Canada and shows no indication of giving up that title anytime soon. And so Honda has brought its A-game to this redesign, and have addressed all the shortcomings — perceived and otherwise — of the outgoing CR-V. The bland exterior has been replaced with a toned and taut new body, with muscular wheel arches and all-new LED lighting front and rear. 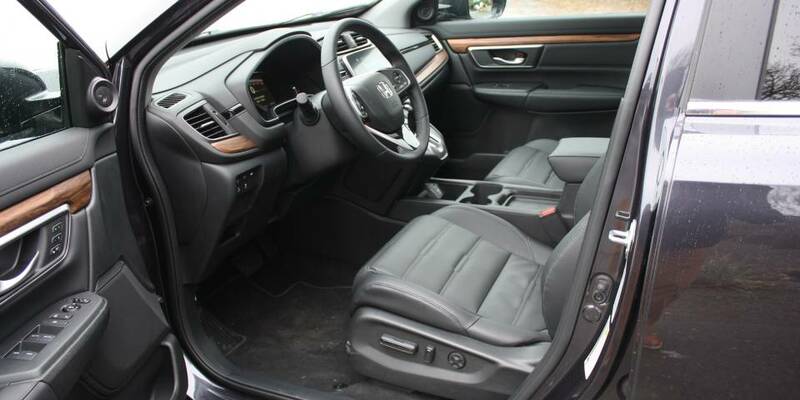 The plain interior is now a sophisticated space with luxury level trim quality, sculpted design elements and all the tech goodies the competitors offer. 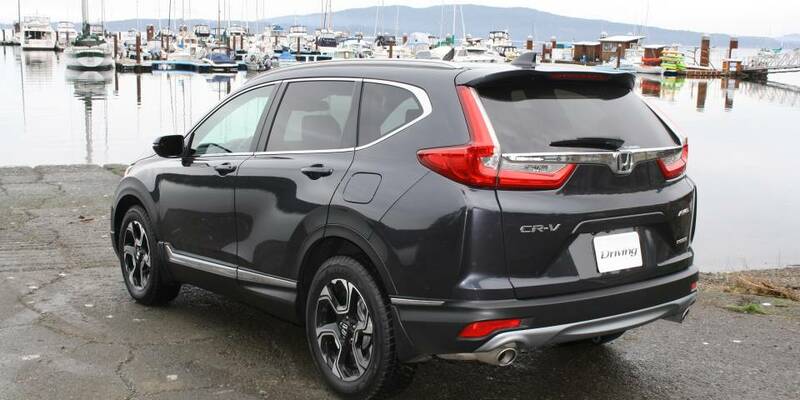 Thanks to that new bold body style, the new CR-V looks bigger than the 2016 model. It is, but only slightly longer, wider and taller, and its ground clearance has expanded by 38 millimetres. The most important increase is that of a 40-millimetre-longer wheelbase, which translates into 53 millimetres being added to rear seat legroom. That larger size also allowed for bigger rear seats. Those seats also underwent a redesign, so that they now fold flat to create the best-in-class flat cargo space at over 1.8 metres. 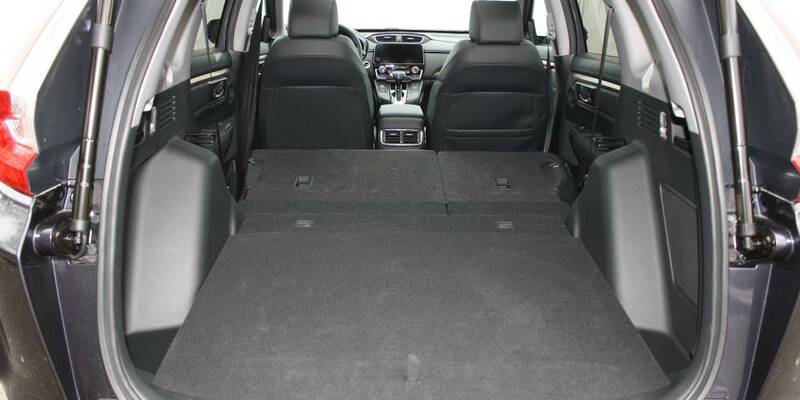 And accessing that cargo space has been improved too, as Honda has taken a page from Ford and developed a hands-free power tailgate – though did their competitor one better by creating a tailgate height adjustment, a helpful thing for shorter drivers and if you are opening the tailgate in a garage with a low ceiling. 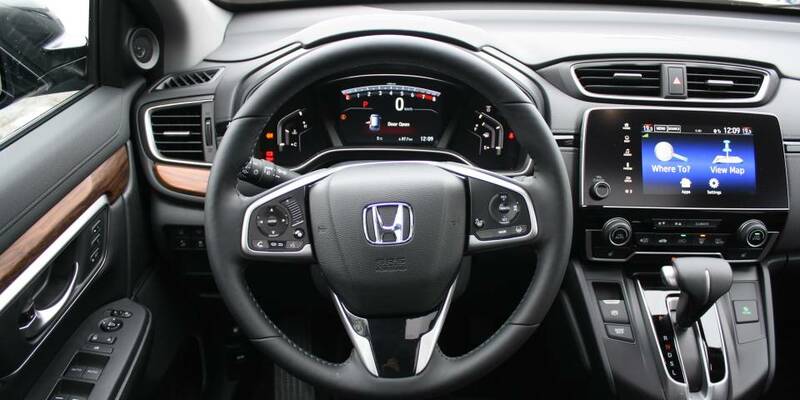 Honda also took the advice of its current gen CR-V owners, many of whom voiced their displeasure at the touchscreen volume control for the audio system. That’s something all new model Hondas have, and while it might seem to be a ‘tech-friendly’ way to adjust the volume, in practice it is a real pain. Bring back the dial, owners pleaded. And Honda listened! Expect to see that humble little volume dial — the kind you twirl between your fingers — to make its way into the rest of the fleet in the coming years. 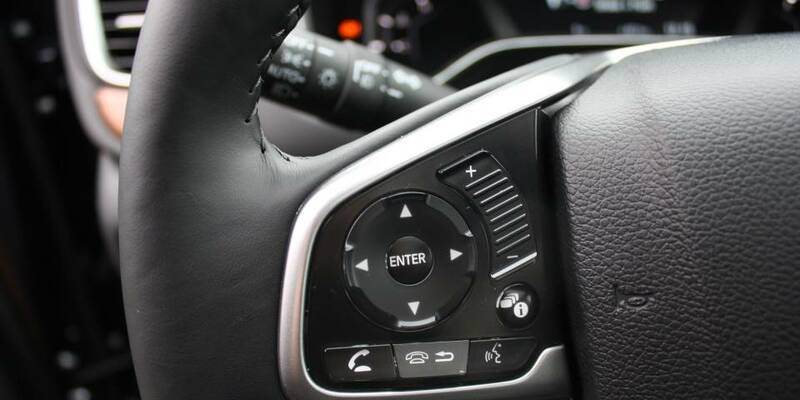 New standard features include remote engine start, dual-zone climate control, an electric parking brake, rear USB charging ports, a front passenger seat with four-way power adjustment, plus a driver’s seat with eight-way power adjustment and four-way power lumbar support. 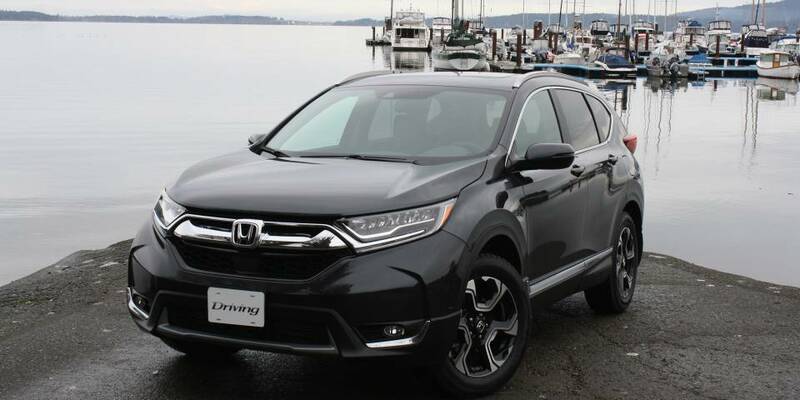 In terms of trims and pricing, the base front-wheel-drive CR-V LX starting at $26,690, while the top of the line model is the AWD Touring with a price tag of $38,090. In between are the EX and EX-L trims, both AWD models. 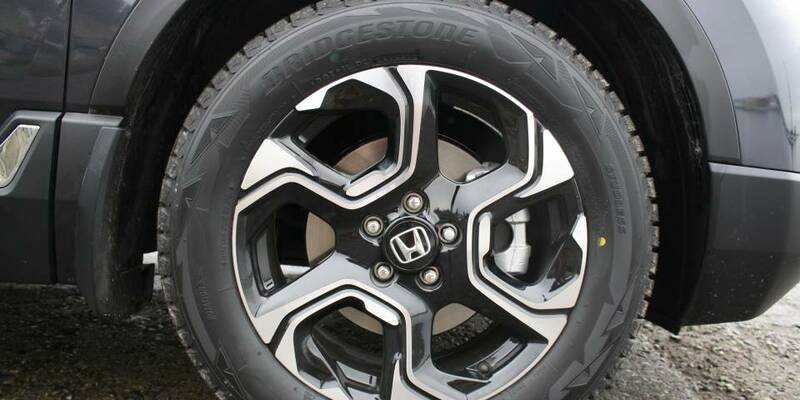 According to Honda, 90 per cent of CR-V buyers in this country will opt for an AWD model. Those Canadian buyers will also be able to get some Canada-only content in the top two trim levels, in the form of a heated steering wheel, heated rear seats and a massive panoramic sunroof. Our drive route took us from the Oak Bay suburb of Victoria up to the surf mecca of Jordan River, then back down and over the Malahat Highway to Brentwood Bay. So, a very diverse day of driving, with a good mix of city streets and highways, some decent elevation changes and even some twisty blacktop to test out the new chassis. I came away from the day’s drive with a number of lasting impressions. First, I still find myself surprised at how impressive sub-2.0-litre engines are today. Sure, this little 1.5 four-banger is turbocharged, but it never left me feeling underpowered nor did it rev high to complain about the effort. Second, I was equally astounded at the gas economy figures I recorded on the four legs of my drive, ranging between 50 and 90 kilometres. Not using the ‘Econ’ mode, I posted 7.2, 7.1 and 6.3 L/100 kilometres on three of the legs, and on the last – from Brentwood back to Oak Bay up and over the Malahat – using ‘Econ’ mode, 7.2. Honda claimed the 2017 CR-V would have class-leading fuel economy, and my numbers certainly back that up. Third, the cabin was very quiet, this despite being warned that due to the winter tires on all the testers, road noise might not be true to all-season tires. And finally, this compact SUV was fun to drive. Which also shouldn’t come as much of a surprise as the RAV4 and Escape are also fairly fun. All that said, I did find the centre console to be a pain on my right knee as it intrudes a little into that space. I could adjust how I sat so it wasn’t an issue, but I know from experience that on a long haul I would find this quite uncomfortable. One quibble, though, and not a major one. I won’t go as far as awarding the gold medal before seeing the rest of the competition in full stride, but it must be said that the Honda CR-V will be moving up a step up, or possibly two, on that podium. This entry was posted in CRV Articles on December 7, 2016 by Administrator.